Long coat. Denim cotton garment reaches the lower leg at hem with long slits at each side. It has long sleeves, open at the front, and an embroidered collar in dark brown and tan which is edged with a line of beading and tiny pink pompoms. Edges of bottom hem, side slits, wrists, and front opening are lined in what appears to be red silk? 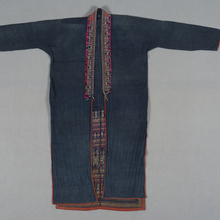 Garment is heavily embroidered on back, from waist to hem, in tan and dark red, bordered by layered bands of red applique. 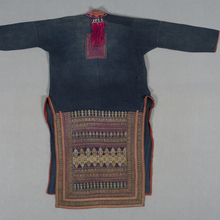 A rectangle of similar embroidery is sewn to the centre back of the coat. Long pink tassels attached to the collar and passing in front of the square have transferred their colour onto it.